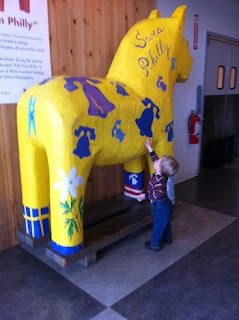 Today, as a continuation of my post about Dala horses, I am sharing with you this wonderful photograph. This is my grandson T admiring the personalized Dala horse on display at the Plymouth Meeting IKEA in Pennsylvania. T's mom and Granna are teaching him about creative design early and bring him to IKEA regularly. He loves the Swedish meatballs! A side note to parents of young children: T's Mom has found IKEA is a great rest stop when traveling with T. They regularly stop at the Elizabeth, NJ IKEA on their trips home. The added bonus is that the restaurant has large windows overlooking the runway of Newark International Airport and T gets to watch the planes taking off and landing.